Your biggest concern might be whether you are fit enough to complete a wilderness adventure. It is a point to consider. However, in my experience most people are fit enough or can get fit enough to take on a wilderness adventure. It’s only a walk on a trail right? Determine your current fitness level and plan accordingly. Choose a trail that matches your fitness or increase your fitness to match the requirements of your chosen trail. I am not a doctor so if you have concerns with your health and fitness, you should consult your physician. Let them know your plans and get their professional advice. This is the motivation that you need to get in shape. I am in relatively good health, but I do have some challenges. I have a history of high blood pressure, but it is regulated with medicine. My larger challenge is sleep apnea. Without treatment, sleep apnea causes me to stop breathing while I’m sleeping. If not controlled, sleep apnea can cause me to become winded after only a few flights of stairs. It can also cause me to be very sleepy during the day. Before my 2016 Yellowstone backpacking trip I used a Continuous Positive Airway Pressure (CPAP) machine to control my apnea. A CPAP machine forces my airway open so that I breath while I sleep. This allows my body to go through the normal sleep cycles. It also eliminates my snoring which my wife appreciates. A CPAP machine is a huge obstacle to completing a strenuous backpacking adventure. Yet, I was determined to find a way. I first explored ways to take my CPAP machine with me and power it from a battery. While this would increase my pack weight by about five or six pounds, I was willing to make the sacrifice. I got as far as ordering a battery and a special power cord for my CPAP. After my first test I realized that it wasn’t going to work. My CPAP only ran for about two hours before the battery was dead. Power solutions to increase the battery time would only increase my pack weight. I needed to find another way. I decided to investigate a dental appliance designed for sleep apnea. Think of something like an athlete’s mouth guard. The device has both upper and lower moldings that combine to force my bottom jaw out. This keeps my airway open so I don’t stop breathing. It is very light weight and a lot more comfortable than the CPAP machine. After having a sleep study, the dental appliance proved to be more effective for me than the CPAP machine. Sleep apnea is no longer a challenge for me and I now use the dental appliance exclusively. Note that there are two types of sleep apnea. The type I have is obstructive so the dental appliance works fine. The other type is neurological which is more challenging. Consult your physician if you have sleep apnea concerns. Assess your health and find ways to address your specific fitness challenges. Hopefully, my experience helps you find other options to address your health challenges. Once you have cleared any significant health obstacles, it’s time to get fit for your adventure. A healthy diet should be a part of your training, but I won’t cover that in this post. I recommend that you start by taking short walks with no backpack. These walks can be around your neighborhood, in a local park, or even at the local school track. Pick easy terrain to begin with. At this point you are getting your body used to walking. Gradually increase your walking distance. Increase your mileage until you are walking close to what your daily average will be on your trip. If you don’t know your distance target, I recommend that you work your way up to about eight miles. Adjust your training once you know your trip plans. Once you get into descent shape you will be able to complete eight miles in about three to four hours. This may be different for you if there are significant elevation changes in your training route. This is a good time to test drive the shoes you expect to use on your trip. Shoes are one of your most important pieces of equipment so figure out which ones work for you early on. I’ll post more details about shoe selection in a future post. 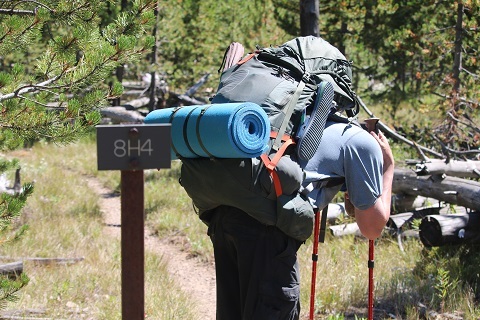 After you are comfortable with your mileage, add a backpack with a few pounds of equipment in it. Gradually increase your pack weight until you are at the weight you expect to take on your trip. I’ll cover how to plan for pack weight in a future post. I train with heavier weight than what I plan to take. Reducing my pack weight for my trip increases the enjoyment. My pack feels so much lighter during my trip. Note of caution: If you are simulating weight with gym weights be sure to protect your pack from the abrasion of the weights. The weights could cause excessive wear and tear on your bag or on other pieces of equipment in the bag. Start adjusting the terrain of your training hikes to match your adventure destination. This could prove challenging depending on where you live and where your adventure destination is. If you are trying to simulate hiking up elevations try to find a building where you can climb the stairs. Do your best. If you do the above, you will increase your fitness and your confidence. You will be ready to tackle your wilderness adventure and you will be healthier. Great job! What are your biggest fitness concerns? Do you have any questions about fitness training for a wilderness adventure? Leave a comment below. Join the discussion. Share with friends. Ask questions.